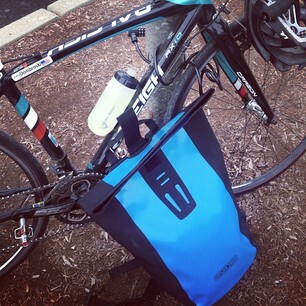 Ortlieb Velocity Messenger Bag: Waterproof, hold everything, and comes ride-ready! It may not have a ton of pockets to organize stuff, but it’ll be coming with me everywhere from now on, considering how easy it made running errands in the rain today! Single Serving Sports Detergent from Go Soap! : I’m working on a review for sports detergent for Cyclocross Magazine, and brands have been sending me samples. I have bottles too, but what I’m really loving for life on the road is these single serve packets from Go Soap. No chance of spills, no chance I forget the bottle, just sports wash when I need it. So into it! Jawbone Up: I just got this little Jawbone Up bracelet to try to keep better track of my sleep, and to avoid the burnout I know I’ll hit at Interbike. I picked this over the FitBit because of the smart alarm function, and this morning it definitely helped wake me up! I’m also trying to keep track of food and workouts on there, though how long I’ll keep that up is the question. I’ll check back in after a couple weeks of use and see how I feel about it. Athlete’s Guide to Yoga App: I’ve been trying to be a bit better about stretching and just daily workout routines in general since I’m all over the place with such a weird schedule. Yoga and corework definitely are the first things to go, so I downloaded this app based on one of my favorite workout books, The Athlete’s Guide to Yoga by Sage Rountree. I figure $5 for an app is better than $20 for a single time walk-in yoga class, though I do tend to love going to them when I can. But with the app, it doesn’t matter where I am in the US, the workouts are about 20 minutes each, and waking up to a new one (there are 5 videos in all) Monday-Friday is the goal. Giro Sica Women’s MTB Shoes: I just finished a long-term review of these, and I admit, it’s the second pair that I’ve had and I wouldn’t trade them for anything! They may take a few rides to break in but they last forever and hold up under the toughest conditions you can imagine! Leg Lube: Sounds whacky but when you’re shaving your legs in different water (soft, hard, etc.) all the time, a good shaving cream is a must, but creams can get seriously messy. I love Leg Lube (good for men and women!) because a couple drops make shaving so much smoother (pun intended) and it comes in a cool small bike-lube style container. It’s also airplane-friendly so it can get through security, and one bottle lasts forever. Bonus: no aerosol, and the bottle hasn’t leaked once! Mavic Bellissima Knicker: I normally prefer bibs to regular knickers. But in this case, I love the women’s Mavic shorts and knickers, because they have a great, more modern style waistband. Instead of being one piece around the waist and super high-waisted, these ride a little lower and have separate panels to make the top almost like a yoga pant with a wider band. I love the Bellissima in particular since it’s simple and black, but has lime green and hot pink piping to add a bit of visual interest. Small warning: they run a little large so consider sizing down from your standard cycling kit size. Rapha Women’s Gilet: Windproof lightweight and packable are the terms Rapha uses to describe their women’s wind vest, and they were right. It’s also wicked stylish, and super practical. I’ve been pretty much living in it as the weather has been turning, and it’s been perfect on rides. Unlike a lot of wind vests, it has two pockets so you can fit normal stuff in them, and don’t always need a jersey underneath (see the picture with that and my favorite baselayer!) It’s not cheap but for something that will last a long time and look much more refined than most cycling gear, it’s well worth it. Assos arm and leg warmers: I recently did a review of Assos’s arm and leg warmers for Cyclocross Magazine, and while I know the prices at Assos are a bit steep, when it comes to leg warmers, I’m willing to pay for good quality and good fit. I get cut by most legwarmers, but these are wicked comfortable and fit like a glove. Since bringing shorts and tights on a trip takes up a lot of space, I’d rather bring two or three pairs of shorts and these legwarmers so I’m ready for every temperature and won’t have to deal with as much laundry. This entry was posted in how to, review. Bookmark the permalink.